Isaiah James May was born a little after 5 p.m. on Oct. 24, 2009, and was scheduled to die this past week – on Wednesday, Jan. 20 – just short of his three-month birthday. 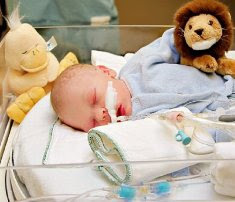 That was the day chosen by Canada's publicly funded, government health service as the deadline for Isaiah to recover from his traumatic birth or be taken off life-support. "There is no hope of recovery for Isaiah," reads a letter from Alberta Health Services delivered to Isaiah's parents and dated one week before the health care system intended to pull the plug on the baby it has determined irreparably brain damaged. "Your treating physicians regretfully have come to the conclusion that withdrawal of active treatment is medically reasonable, ethically responsible and appropriate," the letter states. "We must put the interests of your son foremost, and it is in his best interests to discontinue mechanical ventilation support." Please call to register your complaint! You can HELP please call!